RPM Dual pod filter made by UNI. This filter fits all FJ models. 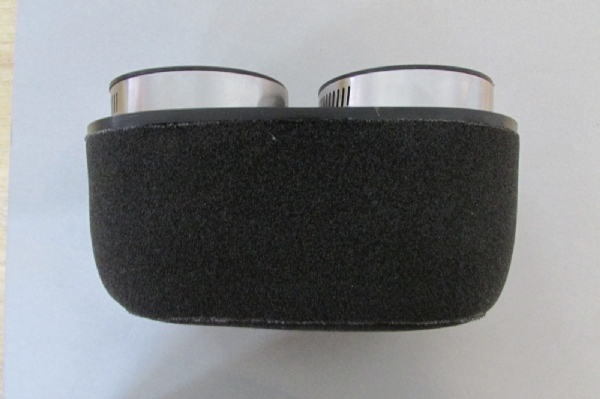 This filter offers superior filtering capability due to the dual foam element construction. These filters are also less susceptible to filter wash experienced by the FJ camshaft timing which causes a fuel mist from the carbs. This fuel mist washes away the oil used in K&N type filters rendering them useless. Crankcase breather filter must also be used. Filter oil and cleaner is not included and must be purchased seperately. I can't believe such a quality product can be had for such a great price. These filters are easy to install, and FIX the crappy upside down Yamaha filter arrangement once and for all. Nice induction noise is a bonus. Another of the excellent products Randy has available for the FJ. These are the best air filters I have used on my FJ, even better than the K&N individual pods. A very simple, inexpensive, easy to install up-grade for every FJ owner. Once installed you have acres of space were the old, monster sized air box once lived!! I fitted my snail shell air horn and a new, replacement fuse box in the void on my '85 FJ. I was happy to find an alternative to that bulky air filter box. The induction noise is SWEET!! !